Plains - these aren't just boring things (they're not always 'plain'!) but large flat areas which you find across America and other nations with huge areas of land. Often, they are where you find battles from ye olde times, as forces and horses lined up against each other (think of some of the scenes in Lord of the Rings for example!) For the people of Israel in Numbers, it offered a place to camp among other things. If you've ever gone camping, finding somewhere flat to pitch the tent is pretty important! A tent was also one place where Moses met with God. Numbers 33.48 - They (the people of Israel) left the mountains of Abarim and camped on the plains of Moab by the Jordan across from Jericho. 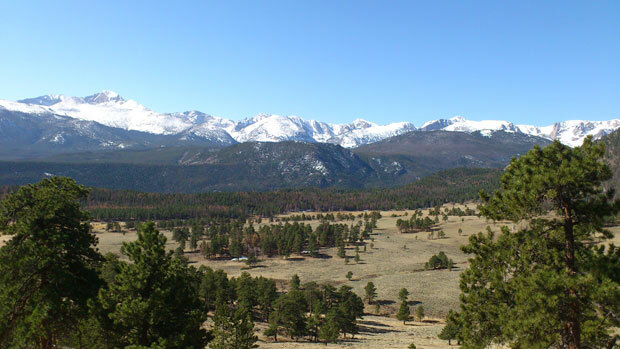 The picture below was taken in the Rocky Mountain National Park in Colorado. It shows a large plain, down below the Rocky Mountains covered in snow above. When you look at the picture, you can almost imagine buffalo roaming it in the past, or cowboys or Native Americans. If you've seen the movie 'Spirit' about a horse who finds himself and his freedom, you will understand what I mean! A plain offers a place to camp but also one where you can be free to hear God's voice in inspiring surroundings. In our Bible verse below, the plains of Moab were a place where God spoke to Moses and the people of Israel. It's a warning for us today as well - we may not go to another land (we may do!) but when we become a Christian, we need to turn away from evil things that aren't of God. But God helps us because he puts his Holy Spirit in us who changes us to become like Jesus! Numbers 33.49-52 - There on the plains of Moab they camped along the Jordan from Beth Jeshimoth to Abel Shittim. On the plains of Moab by the Jordan across from Jericho the Lord said to Moses, “Speak to the Israelites and say to them: ‘When you cross the Jordan into Canaan, drive out all the inhabitants of the land before you. Destroy all their carved images and their cast idols, and demolish all their high places. Many times in the Bible, people of God fell flat on their face before God in an act of worship (as if they were on the flat plains) - humbling themselves. Maybe this is something you need to think about today - hearing from God, turning from idols and worshipping God in a way that says, 'God, I need you, I trust you and I worship you alone'. Maybe you even need to lie down before God. A Prayer: Lord, I humble myself before you. I need you and I come to you flat on my face. I want to turn from all idols and to meet with you. Please speak to me right now. Amen. (Now wait in silence, with your Bible and wait to see what God speaks to you).